Nutrition Month is celebrated every March by Dietitians of Canada. In celebration of eating healthy, dietitians organize events and develop resources that help educate Canadians about healthy eating. Dietitians are passionate about the potential of food to enhance lives and improve wellbeing. We work with our clients to embrace food, understand it and enjoy it while considering their overall objectives, needs and challenges. We look beyond fads and gimmicks to deliver reliable, life-changing advice. Discover: Foster healthy eating habits in children by teaching them about shopping and cooking. To make Nutrition Month come alive for the MBFOM, I’m going to be focusing on the potential to DISCOVER. Most of us in this group have multiple children at home and two main concerns for parents are picky eaters and making sure their kids are eating healthy. Starting from a young age, inspiring children to shop, cook and prepare food can set them up for a lifetime of healthy eating. Yet, a recent Ipsos survey found that 38 per cent of parents rarely or never let their child prepare a meal or snack. Dietitians can help you to shop for and prepare healthy meals, giving children the power to discover better health as they grow. In this article we will discuss 4 tips to help achieve a happier meal time and encourage healthy eating habits in children by teaching them to shop and cook. Children need to be part of the plan from the beginning, and it helps if they choose and prepare something that they love to eat. Take your kids to the grocery store or farmer’s market. Teaching kids how to shop for food is an important life skill. If your kids are old enough you could pick a recipe and go shopping together. 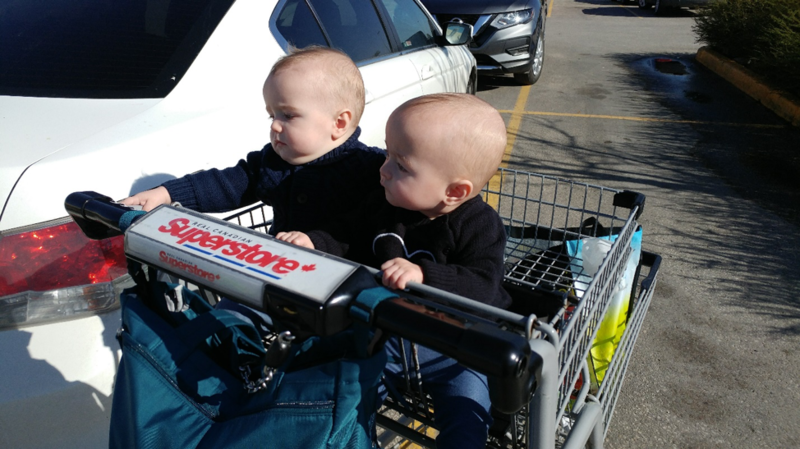 If the thought of taking your many kids grocery shopping causes you to panic, consider taking one on a day you have help for the others and making this a special thing to do with a parent or caregiver. Time is a limited resource for many of us and sometimes kids can really slow us down during a big shop. On days when taking your kids with you is not an option, get your kids’ input on the grocery list. For example, if you’re planning to buy green vegetables, ask them what they’d like best: broccoli, peas, green beans, spinach, lettuce, celery or cabbage? Give them a choice. 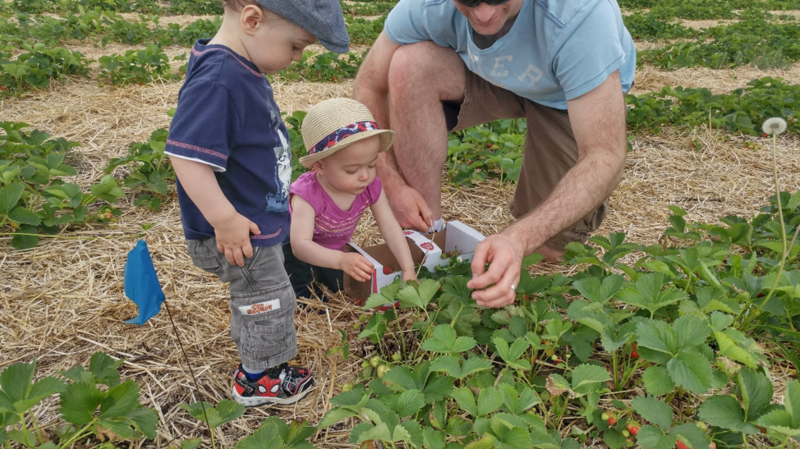 My husband and twins on their first strawberry picking adventure. Call your local public health department www.wrha.mb.ca/community/publichealth/services-nutrition.php or boys and girls club http://www.bgcwinnipeg.ca/to see if they offer cooking programs for children. Many kids cooking programs are offered as part of a camp during the summer months. Kids in the Kitchen is a program that some community centres or after school programs offer. Look into a community garden, start a small herb/vegetable garden in your yard, or take your kids to a strawberry farm or pumpkin patch. Helping with the Christmas baking! It can be fun and rewarding to involve kids in meal preparation – whether it’s at breakfast, lunch, dinner or anything in between. By involving kids in preparing meals, you can nurture healthy eating habits, increase their self-confidence, share culture and family traditions, give them hands-on learning experiences, stay connected and spend quality time together. Encourage picky eaters to try foods they helped prepare and set the foundation for children to learn and improve food skills. Like planning or shopping for food, the ability to prepare meals is also an important life skill that can set them up for a lifetime of healthy eating. Everyone can help prepare meals. 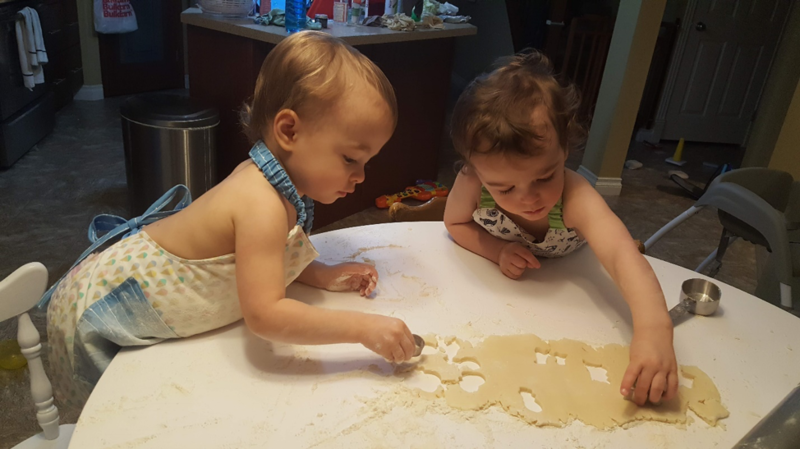 The photo above is my not quite 2-year olds helping with the Christmas baking. I was very nervous letting them help as I am a CRAZY Christmas baker and had a certain standard to uphold. But we had so much fun and they loved it! Make it easy by giving each person a task such as: setting the table, measuring ingredients or preparing and making the food. When you teach your children basic food skills, don’t forget to go over kitchen safety rules. Show them how to use kitchen tools such as a grater, peeler or can opener safely. Here are some potential age-specific tasks listed by Health Canada to help you successfully involve your kids in meal preparation. 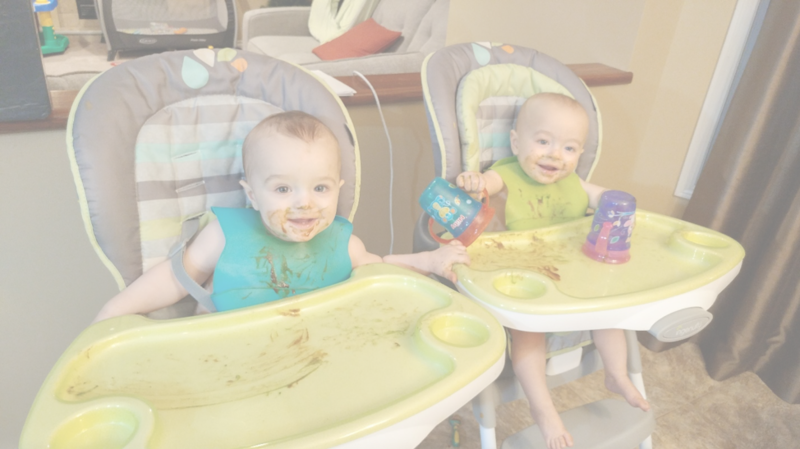 Kids probably won’t be as fast or as clean as you would be during meal preparation. Spills and accidental messes happen, and it’s important to remain calm. Remember to keep the tasks age specific and be cool about the mess. For many people, sharing meals is a favourite time of day to interact with family and friends. It allows people to connect, learn, communicate and listen. 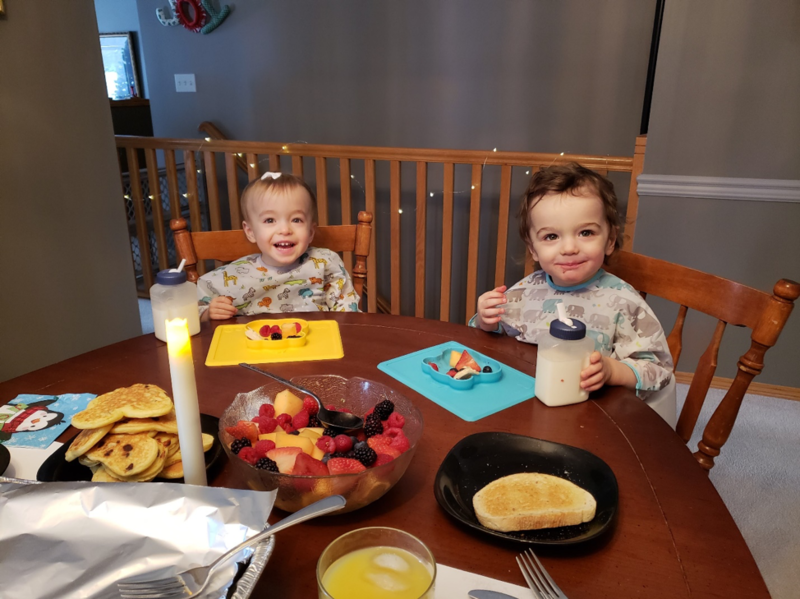 Children who eat with their family have more nutritious diets, better academic performance, a lower risk for being overweight and less risk of eating disorders. Plus, children tend to have increased intake of vegetables and fruit, and a decreased intake of sugar-sweetened beverages. Keep it fun! Imaginative play helps children get deeply involved. Make a theme night or turn your kitchen into a restaurant. Teens who share family meals get better grades, and are less likely to smoke, use drugs or alcohol, or to participate in serious fights. Adults who eat with friends and family tend to eat more vegetables and fruits, drink less pop, eat fewer meals at fast food restaurants, and have lower body mass indexes. Do give everyone at the table a chance to speak. Don’t use it as a time to scold or discipline picky eaters. Sharing family meals doesn’t only mean dinner. If your evening schedule is hectic, share breakfast meals or have brunch together on the weekends. Most studies done on the benefits of family meals start with sharing at least four meals together per week. They all count! Thank you for reading my 4 tips for happier meal times and healthy eating habits. If you enjoyed this post, please share it with a friend. It’s not only parents/caregivers of multiples that struggle with this.